Many people who visit Okinawa for the first time fall in love with Okinawa soba once they taste it, and are wondering how to get some once they leave the island. Japan has many kinds of instant noodles, and luckily there is an instant variation of Okinawa soba, too. The package features Shuri Castle and a lady on the side of the package clad in traditional Okinawan wear that makes it easy to recognize as an Okinawan product. Besides, it’s sold only in Okinawa. Although there are countless restaurants and shops that serve Okinawa soba on the island, it’s not easy to find anywhere outside of the prefecture, and out of the country all but impossible. However, instant Okinawa soba is the solution, although one has to find someone who’s willing to mail a set or two to satisfy the craving. 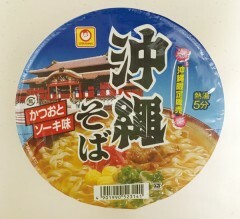 Instant Okinawa soba is made by Toyo Suisan Kaisha, Ltd. The company specializes in making a variety of instant noodles and some frozen food products. All one needs to do to prepare a bowl of Okinawa soba is to add boiling water in the package that is in the form of a bowl, wait 5 minutes and the soba is ready to eat. Adding pork, ribs, kamaboko, vegetables or other ingredients gives variety.